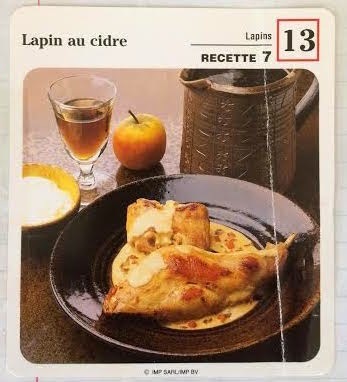 Lapin au cidre is a specialty from Normandy and, as in most of the Norman dishes, apple and cream feature prominently. The dual apple role is played here by calvados, an apple brandy, supported by a dry alcoholic apple cider. The addition of sour cream or crème fraîche creates a luscious sauce you’ll want to eat with a spoon. As I mentioned in my preview post, I am hosting Sunday Supper this week with my talented friend, Tara, from Noshing with the Nolands. Our theme is On the Hunt, so we are sharing recipes with ingredients that are hunted or foraged, including wild game like venison, boar and rabbit or vegetarian options like mushrooms, truffles, wild berries or even edible wildflowers and greens. And to make sure that our urban members could also take part, the recipes can even include a special ingredient that you have to source online or hunt down at specialty markets! I grew up with a father and uncles and cousins who loved to hunt so game wasn’t unusual fare but if you didn’t hunt for it, you didn’t eat it. 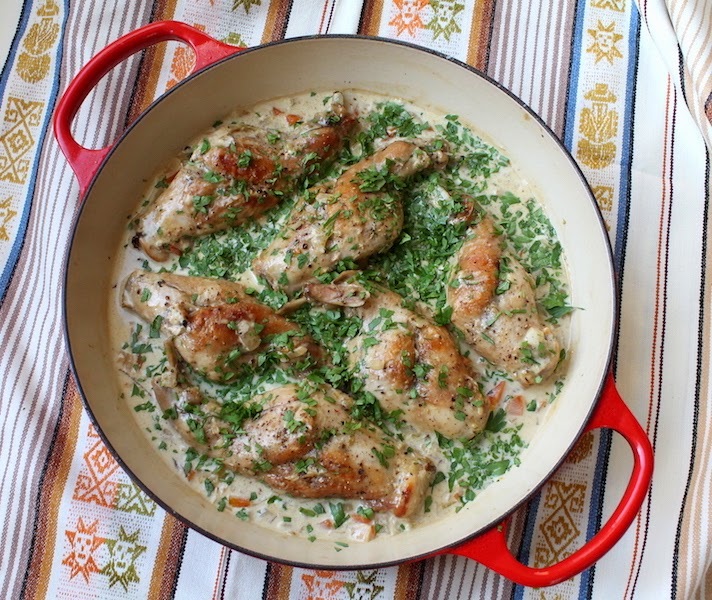 When we were living in Paris though, many moons ago, it was fun to go to the market or grocery store and see frogs’ legs right along side the chicken and rabbit as prominently displayed as the beef. The rabbits were either whole, minus the heads, or more commonly, only the thigh/leg pieces were offered. Those are what I tended to buy. We called them bunny haunches and I’d sing “Little Bunny Fufu” as they simmered. I know, I know, I have a perverse sense of humor. A thousand years as a Girl Scout will do that to you. One day I opened my mailbox to find a big promotional envelope inviting me to join a recipe club. For a number of francs that escapes me now, I could get recipe cards by mail each month. The envelope contained sample cards, which I was free to keep even if I didn’t join. We never know how long we’ll live any place, so I didn’t sign up but I have used the sample cards many times through the years. The reverse has the recipe and says in tiny letters: Cette fiche extraite de la collection Mes Recettes Préférées est un échantillon. Or This record extracted from the collection My Favorite Recipes is a sample. Peel the carrots, shallots and the garlic. Chop them finely, along with the celery. Heat the butter and oil in pan large enough to fit all of the rabbit pieces in one layer without too much crowding. Brown the rabbit pieces on both sides in the pan. Once they are browned, add the vegetables. Don't forget the shallots like I did. I added them later, after the calvados. You add them now, okay? Fry them for a few minutes and then add the calvados. You are supposed to flame it at this point but I couldn’t get mine to light for a photo. Add in the cider and season with salt and pepper. Add in the thyme and bay leaves. Cover the pot and cook over a low flame for about 50-60 minutes. At the end of the cooking time, add in the crème fraiche and mix well. Cook for a few more minutes with the lid off so that the sauce can reduce in volume and thicken slightly. Taste the sauce and add more salt or pepper if needed. Sprinkle with chopped parsley and sing a round of "Little Bunny Fufu" to serve. Have a look at all the fabulous On the Hunt recipes my Sunday Supper friends are sharing today! And scroll down for details on how to join us for the Twitter chat this evening that Tara will be hosting.